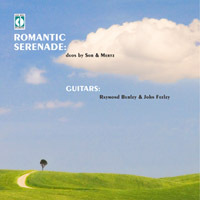 It's just been announced that as from 31st January 2011 Raymond Burley and John Feeley's CD 'Romantic Serenade' is to be the Irish radio station Lyric FM's 'Recording of the Week'. ACOUSTIC magazine issue 49 Jan 2011. RAYMOND BURLEY & JOHN FEELEYRomantic Serenade. Fernando Sor and Johann Kaspar Mertz led the way in developing the classical guitar repertoire by exploring the duet. Here, two Englishmen take their music into a Hampshire church and whip up a sparkling confection, bursting with the kind of elegant, courtly melodies you might find floating above a Viennese masked ball. Many of these compositions originally featured the high-strung terz guitar; here the simple use of a capo captures that same rippling clarity over the supporting standard-tuned instrument and allows for a wonderful contrast in tone between the two players. Burley plays immaculately throughout, while Feeley matches him stride for stride. Duets by two masters: one the Beethoven of the guitar, the other more in the spirit of Mendelssohn or Schumann. This recording offers more variety than might initially seem to be case, given that it features guitar duets by two near-contemporaries who composed according to musical traditions established in Central and Northern Europe. But whereas Sor wanted to revitalize the guitar repertory with works that could rival Beethoven’s piano compositions in scope and seriousness, Mertz (1806-1856), born a generation after Sor (1778-1839), is closer in spirit to Mendelssohn and Schumann. Sor is in fact sometimes called the Beethoven of the guitar, and listening to his ambitious Grandes Sonates in four big movements, one can hear why; they’re as challenging to both the performer and the audience as many a Classical-era piano sonata. On the other hand, Mertz liked to attach fanciful titles to his compositions in the manner of early Romantic-era character pieces. Some of his titles bring to mind Louis Moreau Gottschalk, although Mertz’s pieces are more sedate, less sentimental than the American composer’s, at least on the evidence of the duets offered here. (Then again, Gottschalk wrote his works for his own use and so put a premium on audience response.) Three of the pieces here—Am Grabe der Geliebten (“At the Grave of the Beloved”), Trauermarsch (“Funeral March”), and Ich Denke Dein (“I Think of You”)—are from a series of funeral laments that Mertz penned. Trauermarsch features interestingly strained harmonies and modulations, while Am Grabe der Geliebten features heightened dynamic contrasts and nervous dotted rhythms, all in the service of portraying the emotional state of the bereaved. Vespergesang goes in for pictorialism, starting with churchgoers walking to vespers, followed by the bell-like sounds of the vesper song itself. Unrühe, “Restlessness”—with its fleeting arpeggios, syncopations, and sforzandos—is true to its name and puts the players through their paces. If, like most duet material, this was written for amateurs, Unrühe would sorely test their skills. Mertz’s duets were written for one regular guitar and a terz-guitar, which was tuned at a higher pitch. In order to match the sound of this combination, modern guitarists place a capostasto (a device for raising the pitch of the instrument) on the third fret of the strings of the guitar playing the primo part. This adds even more interest to Mertz’s already-interesting pieces. Unlike his more ambitious music for solo guitar, Sor’s duets were clearly composed with amateurs in mind. In fact, L’Encouragement is a teaching piece, the primo part, written for the pupil, being the more difficult, the secondo role (for the teacher) featuring mainly chordal accompaniment. Napoléon Coste, a student of Sor’s, later redistributed the material to give the “teacher” more to do, and that’s the version most often heard today, including on the current recording. The two Sor duets take the same form: an introduction followed by a theme and variations (a paltry two variations in the case of Op. 54 bis), capped by a dance movement. While Op. 34 ends with an elegant Valse, Op. 54 bis makes a rare and very pleasing excursion to Sor’s native Spain (Allegro dans le genre Espagñol). Given Sor’s preference for French culture and his avowed aim to match the Classical masters, he rarely returned to his musical roots; more’s the pity, given the added piquancy of this Spanish dance. The playing of Messrs. Burley and Feeley is amiable, fluid, colorful—in short, they bring all the right stuff to these largely undemanding but entertaining compositions; the pair is given an attractively bright and intimate recording as well. Sor doesn’t need the advocacy half as much as the less-heard Johann Mertz, and this recording does him and guitar aficionados a real service. So whether you’re placing your bets on the favorite or on the surprising dark-horse entry, this is a recommendable recital.